Yesterday we worked on this pattern. By the end of the period, we had two different rules. Today we had to decide whether or not these two rules were equivalent. We had a brief discussion about the different ways students could make their argument: numerically, visually, symbolically or verbally. I asked each student to choose a method they preferred and spend a few minutes constructing an argument. The plan was to then have them pass their journal around the group and have their partners help them make their arguments more convincing. 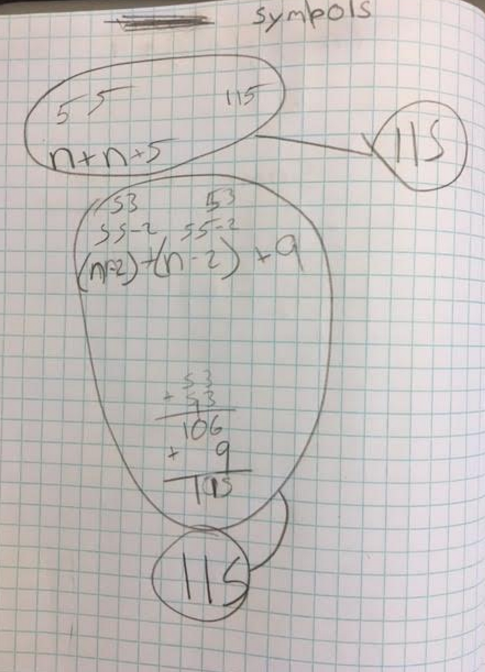 As I circled around the classroom, I noticed the work of a particular student who doesn't yet have the confidence I believe will eventually show up. I stopped and asked him about his work. Me: So, tell me about what you have going on here? Me: What type of argument are you trying to make here? Me: Ok, so what numbers are you choosing? Me: Does it work for both rules? Me: Now that I'm sitting here with you and hear you explain, I can totally understand what you're trying to say. Me: Let me ask you something: Do you think that if you ripped this page out of your journal and left it for me to read after class, I'd be able to understand your argument? Student: No, I don't think so. Me: Can you treat this as a rough draft and try to convince me as if I wasn't here? Me: Ok, great. I'll come back and check in a bit. I asked if I could have his permission to take a picture of both and show it to the class. We'd keep it secret if he wanted, I assured him. When I projected the first iteration, other students tried to explain his thinking. 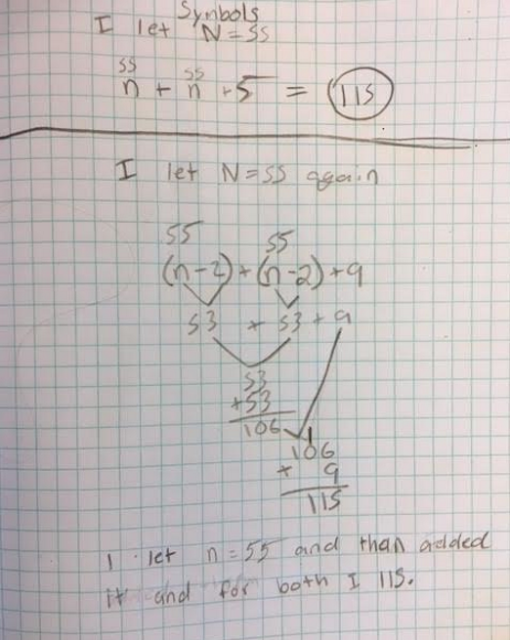 When I showed the work of the "second student", we all agreed it was much easier to follow the thinking. Then I said, "This is the same kid." The coolest part of this was that when I wouldn't say the name of the student, many of his classmates said, "It's obvious Mr. Cox. Look at him." One of the things I really appreciate about the CCSS New California State Standards is that we want students to make connections across domains and grade levels. And, while some may disagree with me here, I appreciate the transferrablilty of the standards for mathematical practice. Things like attending to precision, constructing viable arguments, critiquing the reasoning of others, looking for and using structure, and problem solving in general all play in other content areas life. Any chance I get to make a connection to another area, I do it. I read an article a while ago by Hung Hsi Wu where he treated a variable as a pronoun. It made sense to me. It makes sense to my students, so we go with it. We are about to dig into equations and expressions, but I really can't stand how textbooks approach this. You get to see maybe one or two simple expressions that may be tied to a context, but then a million exercises with expressions so complicated, there's no way a kid can tie it to anything that matters. So here's where pattern problems come in. Fawn has done a tremendous service for us. I'm also really digging Dudamath lately because I can be more intentional with the patterns I put in front of my students. Seriously, if you haven't played around with this site, go there now. It's pretty amazing. We've done a few pattern problems and we are getting the hang of doing the generalization, but writing an expression has been more difficult. So, here's where Wu helped. Our morning announcements just mentioned our volleyball team won yesterday, so that provided a nice context. I wrote these sentences on the board and asked if they could write one sentence that captured the essence of all the others. "Maria, Shanay, Teresa, Jan and Jill played volleyball." "Maria and her friends played volleyball." and it didn't take long for us to settle on some version of 3 + n.
The groups then went to work on today's pattern problem. The use of some sort of variable when trying to describe a rule made it's way into their work. Many of the groups are still in progress, but movement was made today. Let's see how it goes tomorrow. The struggle here is real. A student has no idea where to place a fraction on a number line (because fractions aren't numbers, of course) but can convert to a mixed number like a champ. This applet gets at the heart of the things I've enjoyed working on lately. The initial estimate offers very little help, but as the student progresses through, they have more references which allow the revisions to become more precise. When my students worked with this applet, there were audible groans when I asked them to lower the lids on their computers as well as exclamations of "I got it!" when they moved closer to 0% error. 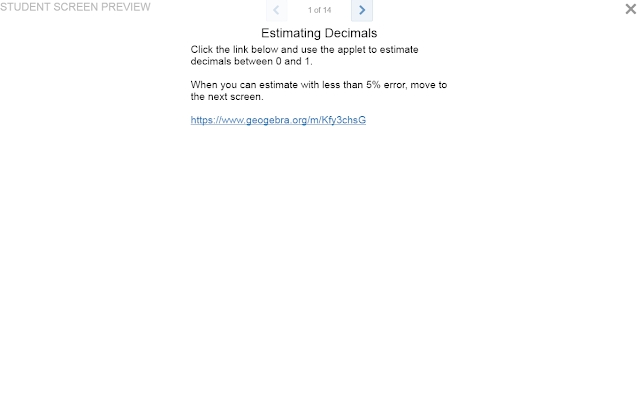 Here's a GeoGebra book that goes from estimating fraction to addition to multiplication. I'm still working on division, but that should drop soon. I swear I'd give CalcDave's left arm (you're right handed, right Dave?) in order to be able to embed a GeoGebra applet into a Desmos activity. I mentioned it, once or seven times, but that's right about the time the Desmos customer service director seems to drive into a tunnel. I mean, I don't hate this activity or anything. But I hate this slide. 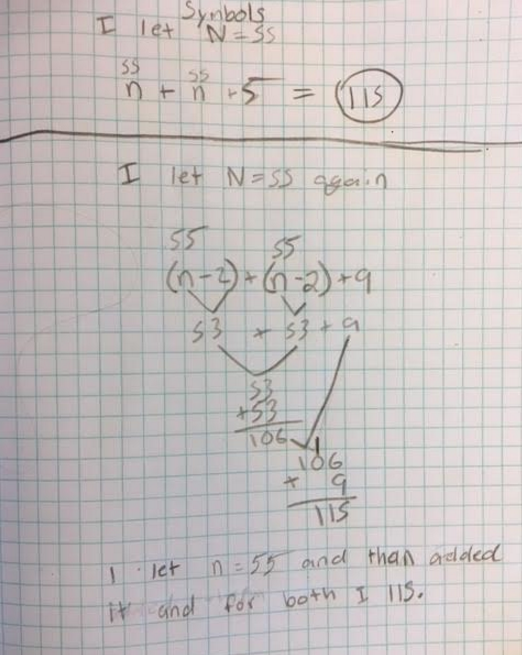 Sometimes students show a misconception that makes me pause and wonder how we can continue without clearing this up. Sometimes the misconception isn't their fault. Take the "-" symbol for instance. Are we talking about subtraction? Negative numbers? How about "the opposite"? Or inverse; maybe it's inverse. I gave students this number line today with the prompts. 1. Tell me everything you can about the number P.
2. 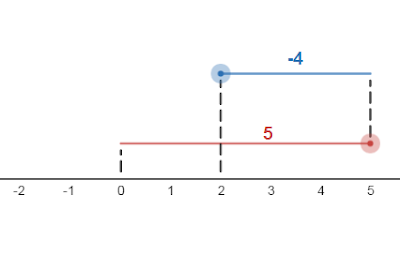 Show where -P is on the number line. Tell me everything you know for sure about -P.
"P is on the negative side." "P is a negative number. It's between -2 and -3." "P is probably about -2.7 because it's closer to -3 than it is to -2." Ok, I'm loving this. Then they drop the hammer on me. "-P is also on the negative side." "-P has a negative sign in front of it so it's also negative." What are your first steps when you encounter thing like this? Pick a teacher's blog. Go ahead, pick one. Go through the archives and you'll likely find a post talking about vocation or calling or some other noble reason to enter the profession. You'll also find some variation of the phrase "I don't teach subjects; I teach children." These are all true, but I don't think they get at why I teach. I mean, I'm no Mr. Shoop and, while, I do think there's satisfaction to be found in helping others, I'm not quite ready to side with the Tribbianian philosophy of good deeds. What I am willing to admit is that one of the things that keeps me teaching is a little selfish. Let me explain. When I was in high school, I took one of those aptitude tests. The results of that test told me I should either be a teacher, a youth pastor or, yes you guessed it, a cab driver. At first, I was thinking, "Cab driver? What's that about?" But as I thought about it, these three career paths have something in common: people. So, then why teaching? I'm going to try to impact people no matter what I do. So why teach? That brings me to the selfish reason: Teaching is a case study in why people do what they do. I'm really interested in that. Dan recently asked about the motivation for moving away from the text book when lesson planning. I think this gets at why I'd rather do my own thing even though I didn't realize it when I first responded. I want to know why kids do what they do, and most textbooks can only expose what they do. If I make my own activity, I can ask the questions the way only I ask them. It's my way of starting the conversation with my students. Today was a great example of this. 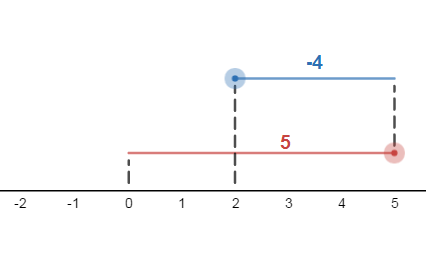 We were working through a Desmos activity where kids had to model sums using a number line. (I really wanted them to be able to sketch on an interactive graph, but, whatever, can't have everything.) But this activity exposed two really important misconceptions. One I was very aware of and the other I had never considered. I've seen this one before. Often times students count the numbers and not the spaces. Ok, got it. I know how to deal with this. At first glance I thought I had this one pegged too. Students are just stating the length of the segment. 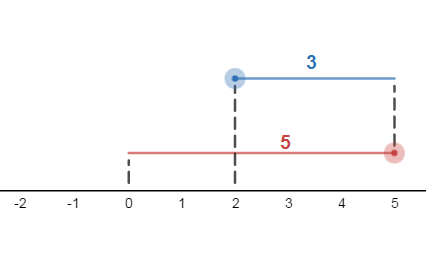 Through the discussion, however, it came out that a significant number of students said the blue segment represented positive three because it was on the positive side of the number line. In 20 years, I've never seen that. It led to a nice chat about direction and location and how these can influence the value of a number. I don't have this conversation locked down. And that's why I want to come to work on Tuesday. That and I want to see if Desmos has those sketchable interactive graphs yet.